My purpose in writing this essay is to evaluate the immigration policy that is commonly supported by conservatives today, especially in the years leading up to and including the Obama-Trump era in U.S. politics, and to show you how this immigration policy is not conservative in any way, how its underlying arguments and mindset are entirely foreign to the American conservative tradition, and how it in fact has far more in common with the ideas and mindset of radical leftist ideologies like those of Karl Marx and Joseph Stalin. Nailing down a definition of conservatism is no easy task, but generally American conservatism has been characterized by an intellectually rigorous understanding of and commitment to rule of law, individual liberty, and limited government. 1. A conservative immigration policy would not violate anyone's individual liberty. Individual liberty has always been of paramount concern to American conservatives. Current U.S. immigration policy has been a longstanding violation of the individual liberty of so many immigrants. As our Founding Fathers agreed, *all* men are created equal, and have an unalienable right to Life, Liberty, and the pursuit of Happiness. These rights are inherent to human nature. They aren't just for U.S. citizens, and they don't come from the Constitution. The Founding Fathers said they come from God. The U.S. Constitution and statutory law are supposed to enshrine these self-evident truths, these cornerstone principles of American political exceptionalism. To the extent that a law doesn't (like the innumerable federal laws that conservatives oppose on principle), it is no law at all, but a counterfeit that subverts the very purpose of law. 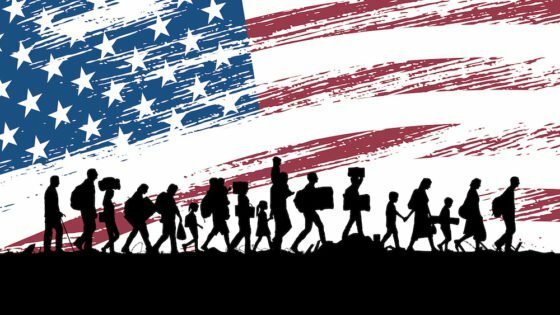 Saying "Illegal immigrants broke the law," sidesteps the essential question of whether the law regards individual liberty to begin with. 2. A conservative immigration policy would not be based on collectivist, socialist premises. Now those who defend strict federal regulations on immigration, such as federal quotas and permits with aggressive police state measures to enforce them, will say that these policies protect the life, liberty, and property of American citizens, and they will characterize the immigrants who come into this country as essentially an unruly mob of violent criminals and welfare freeloaders. This way of thinking is not conservative, because it is essentially collectivist in its premises, and assigns class guilt to a certain category encompassing millions of people in a certain social strata, the way Marxism does. As conservatives will readily and correctly argue about gun ownership, the few individuals who make a choice to commit a violent crime with a gun do not define or characterize millions of others who peacefully and safely bear arms. Many American citizens commit violent crimes, but they are an extreme minority and they are individually responsible for their own actions. Conservatives do not accept the fact that there are violent criminals among American citizens as a reasonable basis for blanket restrictions on the freedoms of the millions of other Americans who have not. Those immigrants who have committed violent crimes are also in the extreme minority among immigrants and they are individually responsible for their own actions. "There were 951 total homicide convictions in Texas in 2015. Of those, native-born Americans were convicted of 885 homicides, illegal immigrants were convicted of 51 homicides, and legal immigrants were convicted of 15 homicides. The homicide conviction rate for native-born Americans was 3.88 per 100,000, 2.9 per 100,000 for illegal immigrants, and 0.51 per 100,000 for legal immigrants (Figure 2). In 2015, homicide conviction rates for illegal and legal immigrants were 25 percent and 87 percent below those of natives, respectively. Illegal immigrants made up about 6.4 percent of the Texas population in 2015 but only accounted for 5.4 percent of all homicide convictions. Legal immigrants made up 10.4 percent of the Texas population but accounted for only 1.6 percent of homicide convictions. native-born Americans made up 83 percent of the Texas population but accounted for 93 percent of all homicide convictions." 3. A conservative immigration policy would not grow the police state. Whatever you let your government do to anyone else, including foreigners, you might just be setting up a future where it's now more likely to happen to you, your children, and your grandchildren. This is an example of the principle Christ was communicating in the Book of Matthew when he says whatever you did for the least of these you did for him. Also when he says in the same book whoever calls someone "You Fool!" is in danger of hellfire. It's a matter of respect. Treating others with contempt, the kind of contempt that makes it possible for the United States to continue getting away with a policy of institutional harassment, threats, intimidation, and the most aggressive possible bullying of immigrants, while being gleefully cheered on by throngs of voters is playing with hellfire. Conservatives, who have been rightly skeptical and fearful of the U.S. federal government throughout its entire history, who have repeated until they are blue in the face to historically naive and uncomprehending liberals that they are stockpiling the world's largest civilian armament because they don't trust Washington not to attempt a hostile takeover, should bristle anytime they see that government abusing anyone, because it's a slippery slope. Think I'm paranoid? In the earliest days of the Obama Administration, the Department of Homeland Security produced two separate memos profiling conservatives as potential terrorist threats and circulated them to state police departments. The first of these, dated February 20, 2009, was entitled The Modern Militia Movement, and advised state police that potential domestic terrorists could be identified by bumper stickers or activism in favor of limited government, state's rights, many of the amendments in the Bill of Rights(! ), the pro-life movement, abolishing the income tax, or withdrawing from the United Nations. Governments throughout the last hundred years have shown a tendency so powerful it's like a law of physics to become tyrannical, and the path of least resistance is always to enlarge its powers by oppressing and terrorizing a scapegoat with the support or apathy of the general population. Once this treatment of any individual is allowed, a terrible crack in the foundation of society forms, and the circle of tyrannical government power widens to include everyone. In Soviet Russia, it was the Kulaks who were scapegoated in this way, but before long everyone would suffer under the crushing heel of Soviet tyranny. 4. A conservative immigration policy would not be based on fear and zero-sum, scarcity mindset economics. The federal immigration policy supporters will say that even the non-violent immigrants to America are violating the life, liberty, and property of native born Americans because they are taking money out of the U.S. Treasury through the federal government's welfare programs, and thus stealing what rightfully belongs to American taxpayers. It's simply untrue. A 2013 report by the U.S. Chamber of Commerce found that: "...more than half of undocumented immigrants have federal and state income, Social Security, and Medicare taxes automatically deducted from their paychecks." The reality is: Immigrants boost economic productivity, pay state and federal taxes, and pay more for federal benefits than they use. According to a 2010 report by the American Immigration Council: "In one estimate, immigrants earn about $240 billion a year, pay about $90 billion a year in taxes, and use about $5 billion in public benefits." Interestingly ICE uses takes more than that ($7.6 billion in FY 2018) out of the federal coffers each year. Even if it weren't true, it's not immigrants that are doing this to Americans' paychecks and job prospects. It's the federal government whose rapidly expanding size, role, and influence conservatives are unwittingly cheering on to implement their immigration policy. The conservative solution would be to reform and limit the welfare state, not grant unchecked, tyrannical executive powers to the vast and ever growing police state to oppress an entire class of people for some undeserved class guilt. It is a dangerous and short-sighted economic strategy. It's also foreign to the conservative mindset, which values rugged individualism, and the ability of anyone to work hard in America's remarkably free market system and create opportunities for themselves, rather than lobby the government to prevent others from competing with them for some kind of economic privilege that they feel entitled to. Ironically enough, immigrants to this country are more likely (twice as likely) than native born, voting American citizens to start a business of their own. 5. A conservative immigration policy would not trample on anyone's private property. It's not merely immigrants that are tyrannized by the federal government's rigid and aggressive police state enforcement of migration quotas and federal work permits for immigrants. As crackdowns on immigrants who haven't renewed their permits increase, federal police are intruding onto private establishments of business where immigrant workers are welcome by the owners as employees. These same immigrants are welcome as customers in other businesses, and as tenants by business that lease residential property. It should be up to these private property owners to decide who is welcome and who is not in their privately owned establishments. This country, all 3.8 million square miles of it, and all 300 million of us on all that land, is too vast for central planners in Washington to decide who gets to be where. The solution, as espoused by conservatives philosophers and economists from John Locke and Adam Smith forward, has been to allow private property owners to decide what to do with their own property, including who is welcome and who isn't. Saying that a few professional politicians, bureaucrats, and police have the prerogative to decide that for all of us is socialist central planning plain and simple. This article was sponsored by The Independent Voter Network.